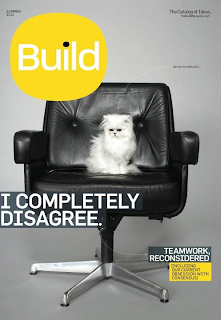 b2b brands: B2B Book List: 5 Things We Love About "Build"
Okay, technically "Build" is not a book. It's a quarterly magazine targeting mid-sized business leaders (print and digital versions available), from the good folks at "Inc." And, okay, technically it's not even a magazine. It's a self-described catalog. "The Catalog of Ideas" to be specific. To-ma-tos/To-mah-tos. You should read it. 1. It covers all The Good Stuff. Content (one of our favorite things) is top-notch. Organized by audience and interest, the inaugural issue includes sections "Your Team," "The CEO," and "What's Next." And these include timely, well-written articles on org structure, communication, alignment, customer strategy, leadership, decisions, managing culture ... a lot of the stuff you need to talk about with mentors and colleagues to get your arms around it. Don't get me wrong -- it's not the Harvard Business Review (also on our Book List), but sometimes HBR is just not what you're looking for. 2. The design and layout are innovative and engaging. (Two of our favorite qualities). Organized and presented in a very visual, eye-catching and richly enhanced style, Build has color-coded its sections and indices, and liberally uses infographics to convey information in a readily understandable manner. 3. The Build Network is the core of the experience. And its raison d'etre is Collaboration. Collaboration takes center stage with this outfit and the Build Network is the actual entity responsible for the publication (as well as its small biz sister pub, Inc.) The Build Network website is a source for events, the publication, picking the brains of experts, and connecting with colleagues. We're watching this "mission" closely for added functionality, because right now it's a little one-dimensional. But, as a first effort, it's worth noting. 4. It's easy to navigate and use. We're not fans of the dumbed down economy, but we like to be able to access what we need quickly. No flaming hoops, no speed bumps. Build is composed of three main sections, visual cues, color-coding, prominent headings -- how easy do you need it? It could only be easier to read and enjoy the publication and website if it was available as a direct brain upload, ala Johnny Mnemonic. 5. Last but not least: It's a gutsy move, based on a well-differentiated strategy. How many publishers do you know who are putting out new magazines in the B2B space? In print? The answer is pretty much zero. Publishing has been sinking into the same tar pit in which conferences and events have been mired. The status-quo mentality figured that "Live events are dead, long live the webinar and virtual conferences!" Not true. Nobody (outside of folks like SAP's Sapphire team and the UnConference) has bothered to think it through. Why would someone go to a live event? Same reason they'd go to a live concert -- they're looking for a unique experience! They're looking for something they can't get on the web. The same is true of publishing. Give your readers a unique experience -- something they can't get exclusively on the web -- and you will attract subscribers, advertisers, and partners. Build and the Build Network are striving to become a unique experience. And we think they're off to an excellent start.